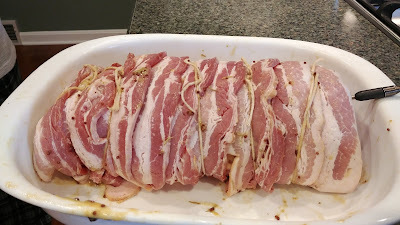 I forgot about this Honey-Mustard Pork Loin with Bacon. We made it last October! I remember it being yummy. 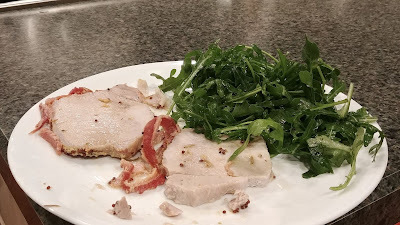 It's easy to make, just a bit of time and effort to prepare the loin for roasting. 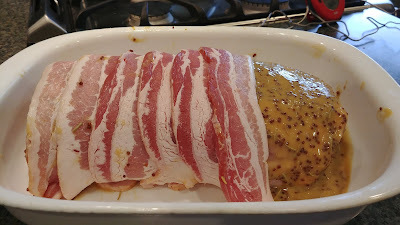 First coat the pork loin with the mustard sauce (mustard, honey, rosemary, garlic), then layer the bacon on top. Use twine to secure it all and roast. Pretty sure we should have done our bacon going the other direction, but... oh well. 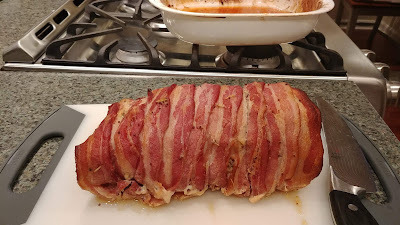 Let it rest a bit, remove the twine, slice and serve. 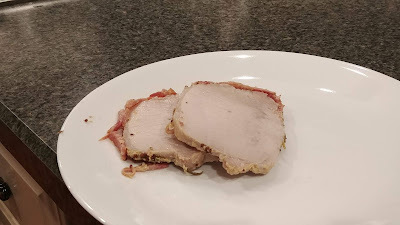 I really liked the mustard-honey-rosemary flavor and wish there had been more of it, perhaps if the loin had been butterflied and the mustard spread on and then the pork rolled up? I felt like I lost a lot of my bacon and mustard when I sliced off the fat. 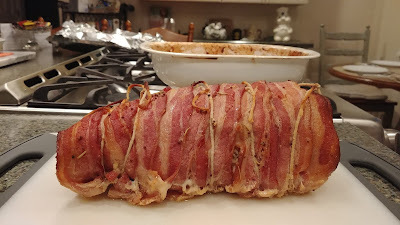 Granted, there was very little fat, but I always cut it off my meat. 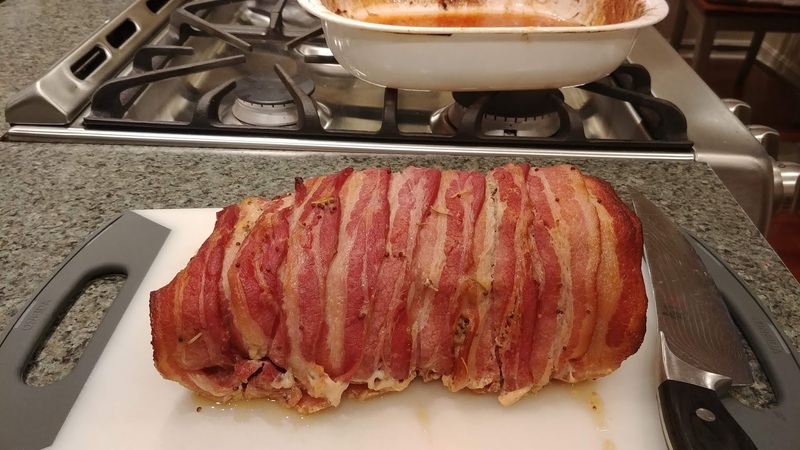 Maybe we should have cut off all the meat fat before saucing & bacon-ing? 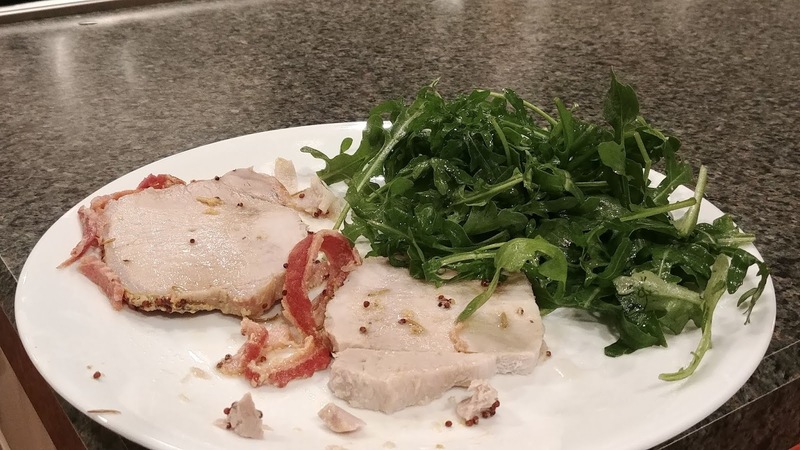 We had some arugula with dressing on the side.